Quickly create quiet, climate-controlled office space with a container office. Paperwork is a fact of every business operation, but the warehouse floor is not the ideal space to manage it. Sweltering in the summer or freezing in the winter, warehouses can be plain uncomfortable when you’re trying to concentrate on administrative tasks—not to mention distracting with the drone of machinery. 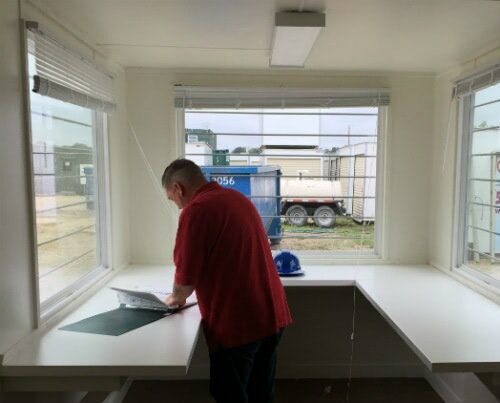 An insulated container office is a fast way to create a quiet, room-temperature work space for meetings, paperwork, and email. On top of creating a quiet space for day to day administration, ground level container offices are an ideal space to host visitors. With polished interior finishes, container offices demonstrate the professionalism of your operation as you handle business with partners and customers. Private meeting space or conference room. Combination office and climate-controlled storage for valuable assets like computers and files. 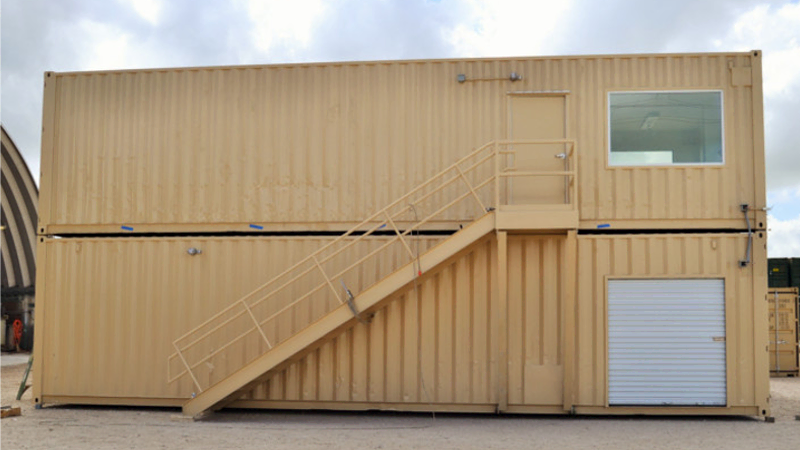 Your one-of-a-kind container office application. Why choose a mobile shipping container office for your warehouse? Speed. Once the truck carrying your container office pulls up, a forklift can place it in your facility in less than an hour. Production lead times are usually around eight weeks. Mobility. You may choose to keep the container on a chassis, for fast relocation via towing. Even without a chassis, a forklift can quickly lift and relocate the office as needed. Security. You won’t need to worry about your files and computers once they’re locked behind the steel walls of shipping container. Minimal Site-Prep. Installing a shipping container office will create minimal disruption to your regular operations. You can place the office wherever there’s a flat, dry, and level surface—no foundation necessary. Comfort. You can take off your jacket and gloves. Insulated and climate-controlled shipping container offices are a quiet, room-temperature place to get business done. Professionalism. High-end vinyl flooring and dry-wall finishes create a polished and tidy-looking work space for conducting business. Skip the construction crew. Container offices are plug and play. Part of managing a warehouse is also maximizing the utility of your floor space. 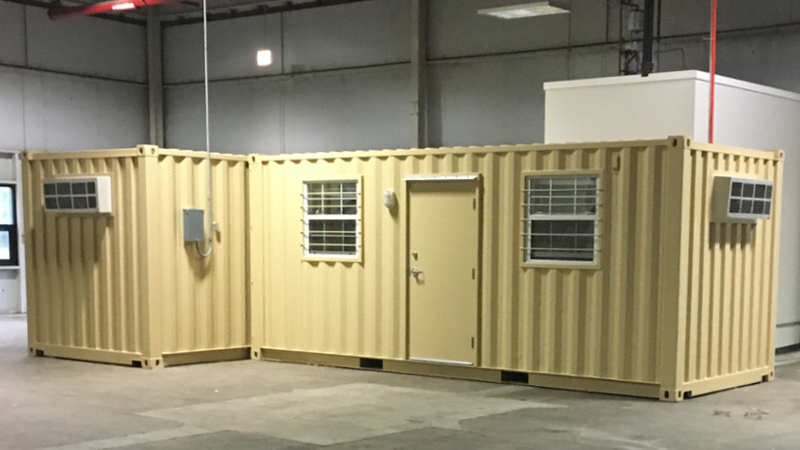 A 20-foot shipping container has a small, 160 square-foot footprint that you can strategically place either in your warehouse or parking lot. In some situations, you can even stack containers—doubling your usable space in the same, small foot-print. Bringing in a construction crew to wall off an area in your warehouse for office space can be a major disruption to the flow of warehouse operations that lasts months. If you have a flat, dry, and level surface—like a parking lot or concrete floor—you don’t need to worry about site prep. Instead, the fully finished-out shipping container office arrives around eight weeks after you place the order, ready to be placed via forklift. We have field-tested floor plans for ground level offices available in our catalog. If you have any questions, contact us at 877-704-0177 or sales@falconstructures.com.